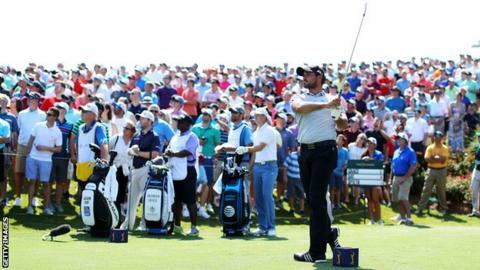 World number one Jason Day equalled the course record to take a two-shot first-round lead at the Players Championship. The Australian hit a nine-under-par 63 at Sawgrass to move ahead of a group of five players that includes England's Justin Rose and Ireland's Shane Lowry. Lowry picked up seven shots on the back nine to come home in a tournament record 29 strokes. Masters champion Danny Willett is seven adrift on two under, while world number two Jordan Spieth is level par. Rory McIlroy, the world number three, also finished nine shots off the lead after a 72 containing two birdies and two bogeys. Day, starting on the back nine, began his round with three straight birdies and reached the turn in four under par. He then added five more birdies when he got to the front nine to equal the course record shared by Martin Kaymer, Roberto Castro, Greg Norman and Fred Couples. Lowry, 29, has recorded only one top-10 finish this season but joined Rose and American trio Bill Haas, Brendan Steele and Cameron Tringale in a homeward run that included chipping in for an eagle-three at the par-five 11th. Willett and Spieth, both playing their first tournaments since an Augusta duel won by the Englishman, ended up well adrift on a day of low scoring. Indeed, Spieth took a seven on the par-five ninth, his final hole, after taking five shots to get down from a greenside bunker. Read more on Willett & Spieth: How will they fare after drama of Augusta?